Not every one of the Bloomberg Businessweek covers has been a hit, but a lot of them are — vastly more entertaining since Bloomberg took over the old workhorse magazine. This one packs a political punch along with visual excitement. And it’s right. Do any Republicans pay attention to the finance and business worlds anymore? Articles inside are informative, too — see Peter Coy’s article, and did you see the article on the debt ceiling issue and the views of past Treasury secretaries? Hey! Republicans! 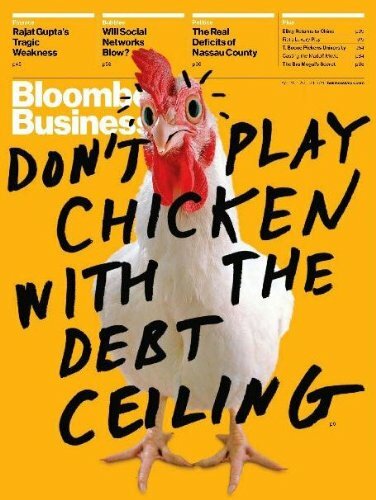 Stop playing chicken with the nation’s credit, will you? This entry was posted on Saturday, May 21st, 2011 at 2:32 am and is filed under Art, Business, Economics, Journalism, News, Politics. You can follow any responses to this entry through the RSS 2.0 feed. You can leave a response, or trackback from your own site.